Gazebos, as shown in Figure 1, can trace a history back more than 5,000 years where archeologists have found murals showing gazebos being used in Egypt. But, the Middle East may not be able to take credit for the development of the gazebo as historians have uncovered evidence of gazebos in early cultures in China and Japan as well as the Mediterranean. In North America gazebos were the traditional gathering places at parks where bands would play into the late evening providing a comfortable rest bit from the heat. Today gazebos can be found to suit almost any outdoor décor style and function. They provide shade and a level floor to place outdoor furniture. They can be the perfect place to entertain guests or can be used to provide a tranquil place to read or contemplate the world. As gazebos are visually open structures it is important that what you see when you look up and through the gazebo is pleasing to the eye. Positioning the gazebo so that there is a view of a garden, bird bath, sun dial or water feature helps to enhance the personal overall feeling of serenity. Of course if you have young children you may want to place the gazebo so that you can watch the tots play on the jungle gym or in the sandbox! Gazebos can be situated to be the focal point of the landscaping or they can be offset so that they blend in to the natural setting. Providing a stone or brick path to the gazebo tends to highlight the structure, whereas a grass path tends to allow the structure to blend in. Many homeowners do not consider the natural drainage under and around their new gazebo installation. If you plan on using the gazebo during the rainy months in your area you do not want to have to take a boat to get to it. Good drainage for your gazebo and the path to get to it is a must if you want to be able to make the most of it. I always recommend pouring a concrete pad rather than placing the gazebo directly on the ground. But, as an alternative you can use a 4 inch base of crushed stone. A heavily compacted #57 bluestone makes a reasonably good base and will stop most rodents from burrowing under the base. Patio and paving stones have a tendency to shift. The use of a wood base, if it is not elevated off the ground, as in a deck structure, is not recommended as the wood that is in contact with the ground will rot. Position the concrete pad or compacted crushed stone so that you have, at a minimum 24 inches around the entire base of the gazebo to allow for plantings, as shown in Figure 2. Gazebos make excellent deck extensions, to provide shade and protect you from light rains. 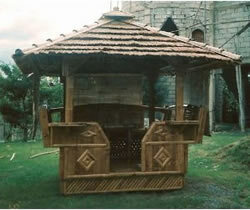 Gazebos come in a number of different materials; Cedar and Redwood, plastic, aluminum and bamboo, as shown in Figure 3. 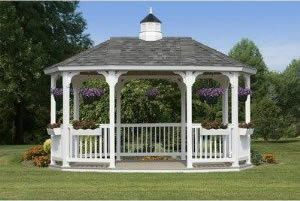 The material you choose should match your deck so that the gazebo blends into the overall outdoor décor. 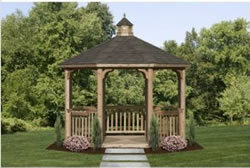 Gazebos also work well nestled in heavily treed areas and/or in areas that have steep inclines and rocks. In areas with steep inclines it is important that the foundation supports for the gazebo bring the floor to a level position. If you are placing your gazebo in a heavily treed area ensure that you do not have large tree branches that might pose a hazard to the gazebo in high winds. It is also very important that the gazebo be firmly anchored to its base. Additional information on anchoring a wood structure to a concrete pad. If you are working close to a lot line, remember that the roof of the gazebo generally overhangs the structure and it is the outside of the roof that must remain within your lot line to avoid problems with neighbors.